TO break cultural barriers is to shorten distances between hearts. Along with the times, the Westerners’ understanding of China has changed, which is also reflected in literature. Foreigners who traveled around China and wrote about the Chinese from their own perspectives and cultures created a quantity of literary works about China on their return. William Somerset Maugham (1874-1965), celebrated British novelist and dramatist in the 20th century, was one of them. In 1919 when Maugham was 45, he set off on tour around China, spending four months travelling up along the Yangtze River for 1,500 miles, and finally reached Shanghai by land on January 3, 1920. The journey made enough of an impact on him to produce a series of books, including East of Suez (1922), On a Chinese Screen (1922), The Painted Veil (1925), The Letter (1926), and Ah King (1933), which formed a major part of his Oriental-themed oeuvre. On a Chinese Screen is a collection of crafted sketches of Maugham’s trips, reflecting his understanding of China and its people. Altogether, the collection of 58 articles paints an interesting collage of the author’s thoughts and impressions on China. 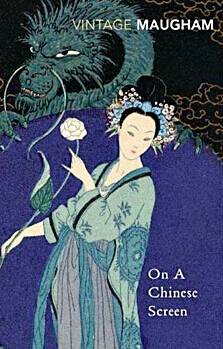 In his bright and incisive writing, Maugham painted on his Chinese screen its people, scenery, and experiences he had in China; those remote, ancient, and mysterious landscapes including the awe-inspiring Great Wall, the turbulent Yangtze River, the tranquil paddy fields, the memorial archway, walls with battlements, varied temples, farmhouses dotted in the bamboo forest, and roadside taverns. Always more interested in people than places, he depicted a variety of Chinese people with a purity of heart grounded in worldly wisdom, revealing the local customs as well as the realities of the life of the British in China. In “The Philosopher,” Maugham wrote about Ku Hung-Ming, a well-known master of Chinese culture. When the author traveled to Chongqing, he set out from the foreign merchant guild district to a quiet and commodious house near Nanquan Town where the master dwelled and wrote down their amusing conversations. Everything fell under the purview of these conversations; from the living environment, the character’s looks and appearance, and their different views on Western and Eastern cultures, the author gave full play to his specialty in writing about human nature, and thus a learned scholar and unique Chinese intellectual was vividly shown. In another chapter, “Dr. Macalister,” the author narrated the account of a British missionary who lived in China for over 30 years. The young man who thought that he might suffer from poverty in China ended up living extravagantly upon realizing the opportunity and Machiavellian tendencies. The title of the book has a deep meaning. First, screen paintings are linked with continuous boards, just like the loosely connected 58 pieces of prose. Second, in the early 20th century, the knowledge of the British on China was within the narrow confines of their colonial milieu, like the living room’s screen in the Victorian era, painted with Chinese-style pavilions and pagodas, mountains and lakes, and personages dressed in flowing robes. Two greatly contrasting worlds were separated by the screen. The colonial mindset of English of that era with their deep-seated pride and prejudice was insurmountable. Maugham, with his critical observation, hoped to paint a lively picture of China for British readers. The book’s title thus is the use of symbolic irony. Third, the author also painted the English officials, businessmen, adventurers, missionaries, and social butterflies on the Chinese screen. Hence, the commonalities and connectedness of human nature also played an interesting role in closing the distances between the Chinese and Britons. The West’s biased imagination on China formed over a prolonged history attracted Maugham to China. However, unlike the visceral and literal images created in other literature or artworks, the author recorded a subjective, yet to him, honest view of China, based on his distinct feelings and philosophical understanding. That image of China in the 20th century, to some extent, overturned the arrogance of the West, helping it to get a fleeting glimpse of the common ground of both cultures and the unique charm of traditional China.